River Beats was created out of a necessity to unite the music scene and give fans what they never had before, a platform to express themselves. River Beats is dedicated to helping all people connect with music and have a say in what they want to see and hear because without the fans there would be no community or movement. Everyone loves a good happy hour. There’s nothing like getting a little tipsy and saving money doing it. In New Orleans, Happy Hour is a key part of this city. We all know Happy Hour well. And everyone has their own tactics of how to attack it. Are you a spot hopper, intent on hitting several places quickly over those quick hours? Or are you an early arriver, camping out at one location for the bulk of your leisure? Maybe you go looking for the snack deals, or maybe you are all about the drink specials. Probably though, you are gunning for both. These are all personal strategies, not to be discounted in any way. We all Happy Hour differently. River Beats may not be able to recommend an approach that works for everyone. 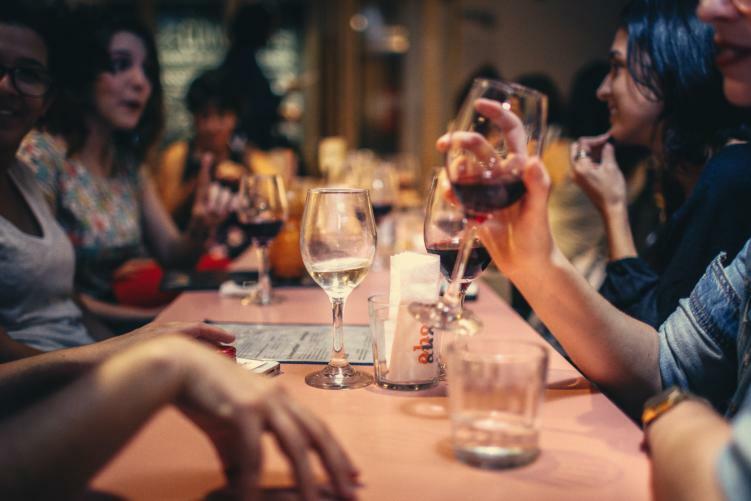 What we can do is make you the best-informed version of your relaxing self by providing a kicking list of spots not to miss when going out on the town. Echos Pizza: 5-6 pm, Daily. All Day Monday for Service Industry. While the biggest news coming from Echos lately might be their pivot to an “all-day” cafe format, we still think one of their best attributes is Happy Hour. Draft beer is pretty cheap and no better place to find a Margherita pizza, you’ll want a piece of this Happy Hour pie. This cozy diner from the team at the Rum House is well known across town as a great place for breakfast. However, their menu goes all day and when it hits that special time opens up for a real foodie-focused Happy Hour. Items such as tamale meatballs, tomato bruschetta, and pimento cheese are all available at deep discounts beside some great deals on drinks as well. The Bayou Wine Garden is our favorite for outside living. The open courtyard has the power to make strangers become friends. I’ve found the deals on Rolling Rock make me feel right at home. What really attracts us is the snack menu, featuring chicken skin tacos, and an absolutely massive basket of coconut curry mussels. Blow up those Anchor Arms, you’ll need them to lift that unit. This writer loves himself an ice cold oyster. Seaworthy is one of the best places around town to enjoy them in style. The swanky pirate pub right underneath the Ace Hotel offers half off oyster from the raw bar throughout the week, as well as some great cocktails to wash them down with. Cane and Table is a wide-open wonder in the world of rustic colonial food. As Eater says, the bar feels like Old Havana. It’s the products that bring such a sentiment to life. Their regular menu features items like crispy Duroc ribs dressed in papaya glaze for goodness sake. Happy Hour menu continues on well with that Caribbean style. We come for the beer and shot combos, a quick way to cut through the fog of a hard-fought work day. Copper Vine is a modern downtown wine pub. The space offers a well-curated list of the grape stuff, offering a Happy Hour that really revolves around it. Don’t let the decor fool you though: the building has such a historic past that it can be found on the National Register. With this old school of a soul, the popcorn bowl stays full. We can’t say enough about Juan’s Happy Hour. Mid-City is our chosen location, but with spots all over town, Juan has ensured they are available to help foster your afternoon buzz. The beer deals can’t be beaten, but the true hitter is their rotating drink specials that keep us coming back daily. When you need to beat the busy-ness of the CBD but still want to be close by for that downtown date later, Barrel Proof is there. Their $5 wings are just right as an early snack, but what really attracts us is that $5 old fashion. Pythian Market is (arguably) the city’s favorite food hall at the moment– and for great reasons. The offerings inside are well cultivated, vendors are friendly, and the cuisine is top notch. Araña Taqueria is one of the best in the business at slinging authentic Mexican. Chef Richard Papier has worked with some of the best including Emeril Lagasse, Donald Link, and Susan Spicer. Members flock to join their Tequila Society, imbibing in worldly mezcal and tequila for some tasty rewards. With one of the lengthiest HH’s on this list, we like Araña for their deals on both food and beverage. Indulge accordingly! Superior is a New Orleans staple, though some might view it as a tourist hub. Though, late at night when the crowds are flocking Bourbon Street, Superior stands as a great value drink for those who are in the know. You can count yourself among those ranks. Do with this late-night knowledge what you will, but have one (or two) for us. Where will we catch you snacking? Follow River Beats New Orleans to keep on the everyday staycation of dining in New Orleans. All photos courtesy of restaurant’s website or social media account.